NEW YORK -- Volkswagen is betting that there's enough life left in the floundering U.S. compact sedan segment to draw new customers to the redesigned Jetta. The Jetta is the brand's best-selling model in the U.S., and carried the water in the market before VW made a big move into crossovers this year with the three-row Atlas and redesigned 2018 Tiguan. 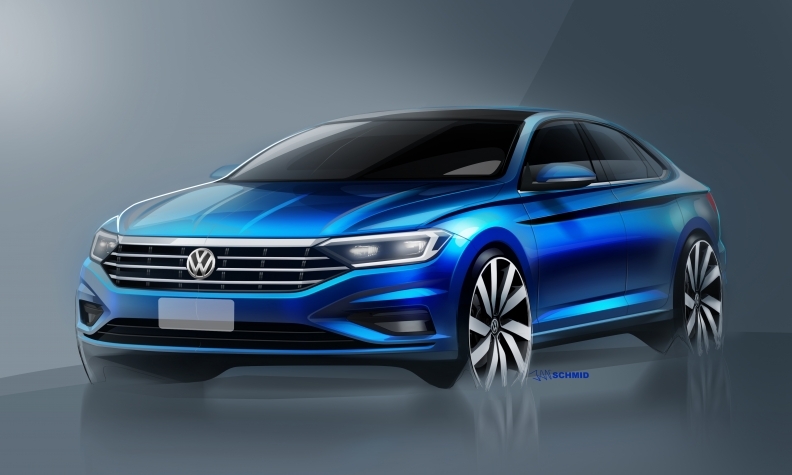 Now, Volkswagen believes that much-improved driving dynamics, more technology and a more fuel-efficient gasoline powertrain in a redesigned Jetta that is moving onto the brand's global MQB platform will draw sedan customers into its showrooms. "It's so important that it's our high-volume car, so this car has high volume expectations, so we really put a lot in there necessary to make it a great concept," said Hinrich Woebcken, CEO of Volkswagen of America, at a media unveiling here. "It's the only German-engineered car in that segment." The redesigned Jetta, which will appear in U.S. showrooms in mid-2018, will continue to be equipped with the brand's 150-hp 1.4-liter turbocharged I-4 engine, but it will now be mated to either an eight-speed automatic transmission or a six-speed manual gearbox. Volkswagen's platform strategy — which uses the same flexible platform for U.S. vehicles ranging from the Golf hatchback to the three-row Atlas crossover — allows the brand to democratize development costs, making it possible to put luxury-level safety equipment into commodity-like segments such as compact sedans, said Matthias Erb, chief engineering officer and head of product strategy for Volkswagen's North American region. For example, the 2019 Jetta will get post-collision braking standard, with optional blind spot monitoring, rear parking assist and adaptive cruise control. "With the platform [strategy], you are producing so many cars, you can afford to offer really state-of-the-art driving assistance, luxury driving assistance, to the customer," and be competitive on pricing with less contented competitors, Erb said. The 2019 Jetta will come with standard LED front and rear exterior lighting, and an updated cockpit will largely mirror the current design of the European 2018 Golf, with available Apple CarPlay and Android Auto compatible infotainment system. 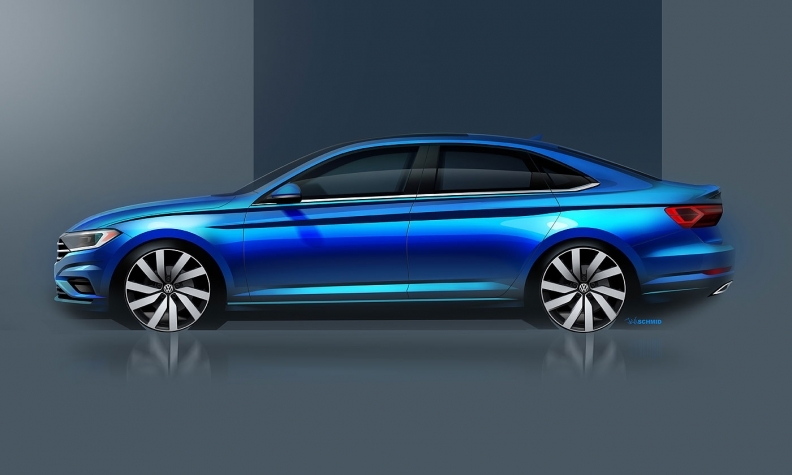 Pricing was not announced but Woebcken said that the redesigned Jetta would be "competitive" with other compact sedans, even with higher content. 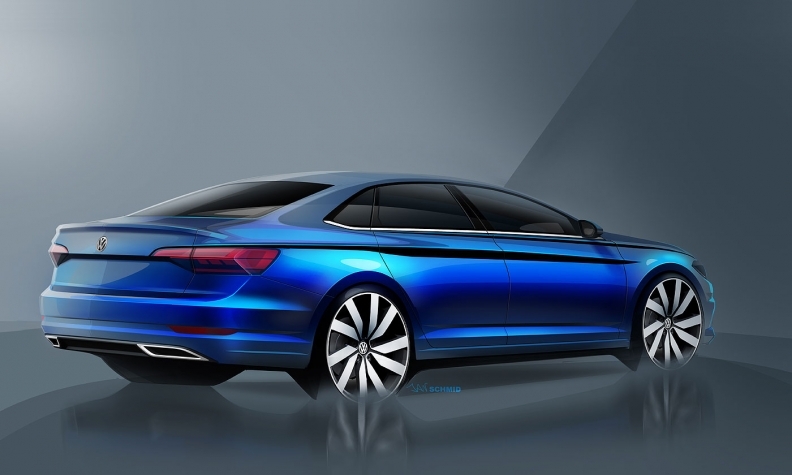 The redesigned Jetta will make its global debut in January at the Detroit auto show. U.S. sales of the Jetta rose 0.5 percent to 108,574 this year through November -- a small gain that reflects the collapse Volkswagen suffered in the wake of its 2015 diesel emissions violations. U.S. Jetta sales peaked in 2011 at 177,360. However, Jetta deliveries declined each year between 2012 and 2016. U.S. sales of compact cars have declined 4.9 percent this year in an overall car market that is on track to shrink for the fourth straight year. In Europe, where customers prefer hatchbacks, the Jetta is one of VW's lowest-selling models with a volume of 5,829, down 25 percent, in the first 10 months, according to JATO Dynamics.